That line, blithely tossed off by Marnie, might be the most shocking part of “Hello Kitty,” an episode that begins with Hannah flashing her crotch at her helpless, flummoxed principal. From its inception, Girls has depicted four young women as they navigate their 20s in Brooklyn. Though they flit in and out of the frame—this episode makes two weeks without Shosh—their lives are interconnected, and each of them is equally important to the narrative. It certainly makes sense that Marnie would regard Adam and Jessa as second-tier friendships, considering how infrequently Marnie and Jessa interact without the other girls as buffers, and her tenuous connection to Adam now that he’s no longer with Hannah and she’s no longer with Desi. But hearing Marnie make this distinction is jarring and takes some adjustment. And it reinforces the idea that Girls is ultimately about the moment when your shallow friendships distinguish themselves as such, then gradually fade away. If that is, in fact, the endgame of Girls, “Hello Kitty” will be remembered as a pivotal episode of Girls. It’s not a high-water mark for the show in terms of quality, but it’s the first Girls episode to show what looks like irreparable damage to one of the show’s core female friendships. These characters have had some ugly confrontations over the years, from Marnie and Hannah’s blow-up in season one, to the emergence of Mean Drunk Shosh in “Beach House,” to Hannah and Jessa’s rice pudding meltdown earlier this season. But that type of confrontation, as uncomfortable and unsettling as it can be, suggests a relationship that can be salvaged. If you’re emotionally invested enough to get really upset at someone, there’s a theoretical path forward with some effort and compromise. Hannah’s run-in with Adam and Jessa is awkward, but quiet and restrained. Hannah forces herself to congratulate Adam for his performance, but doesn’t openly acknowledge what’s happening in front of her. Jessa can’t even bring herself to cough up a proper goodbye when she and Adam leave together. The scene is similar to so many television break-ups that whimper when you’re expecting them to go bang. Given Hannah’s emotional volatility and complete disregard for social norms, I had very different expectations for the moment when she found about Adam and Jessa’s relationship. Sarah Heyward’s script sets up for something dramatic early on, with Hannah exposing herself to get out of trouble at work, then casually mentioning the incident to Fran with no awareness of how inappropriate her behavior is. Then the episode unleashes Hannah on an experimental performance space, as Girls so often does, as in last season’s “Ask Me My Name.” This time, the space is an apartment building that has been converted into 38 Neighbors, an interactive theater piece about the people who stood by as Kitty Genovese was murdered in 1964. Adam is playing one of the neighbors, and everyone shows up to support him, including Hannah and Frank. There’s a disaster in the offing if you put Hannah in a space where the line between reality and performance are blurred. 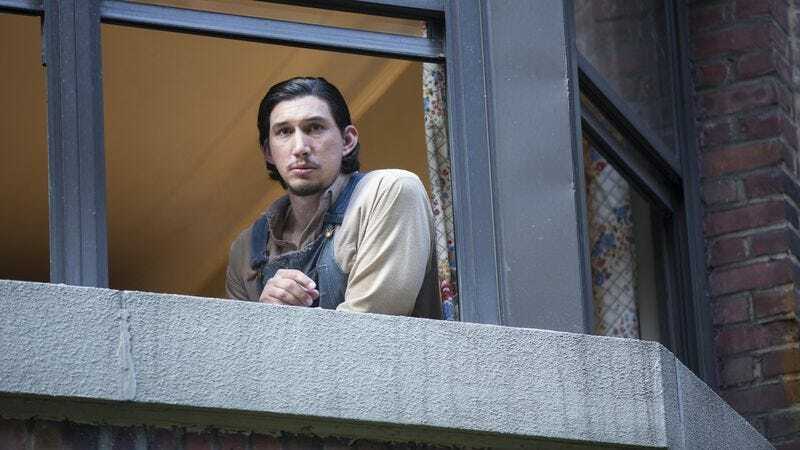 Oddly enough, when Hannah notices Jessa lovingly gazing at Adam from the fire escape, she doesn’t confront either one of them directly. She slowly registers what she’s seeing, the revelation illustrated by a terrifically intimate camera movement, then consults with Marnie and Ray. Marnie is dubious and dismissive, but she’s dismissive because she’s dubious. I’ll be curious to see how Marnie reacts when the bombshell is confirmed to her, especially since her rectitude so often clashes with her inability to set appropriate boundaries. Ray can’t give Hannah his full attention because he’s suffering the consequences of Marnie’s struggles with boundaries. Marnie can be self-centered, like any character on this show, but she’s not totally obtuse. But you could be forgiven for thinking otherwise as she pulls Ray aside for a private chat and tells him about the divorce as a prelude to announcing her decision to be alone for a while. Fortunately, Ray has at least partially inured himself to her charms. Fran is too absorbed in his fight with Hannah to notice what’s happening when she’s addressing Adam and Jessa after the performance. He’s being a bit obtuse too. There’s a lot of nuance in the moment, and if Fran wasn’t privy to the history between Hannah and Adam, his inability to understand what she was going through would be understandable. But on Hannah and Fran’s first official date they went, at Hannah’s insistence, to Mimi-Rose’s art show, where Hannah saw Adam for the first time since their devastating break-up. Fran and Adam mumbled their way through niceties in “Wedding Day,” confirming their mutual awareness of what each other means to Hannah. It seems like a pretty major thing for Fran to miss. Who knows why he didn’t pick up on the significance of the moment and act accordingly. But the result is Hannah being forced to look away, cry in silence for a moment, then steel herself, much as she had to do when trying to comfort her father in “Good Man.” When Hannah was with Tad, she was crying about what appeared to be the end of her parents’ relationship. With Fran, she’s crying about what appears to end of one of her closest friendships. One of her closest second-tier relationships, at least. The title is cute, but an awfully weird pun. I’m starting to have real trouble understanding how these relationships work with regard to attending each other’s performances and engagements. Why would Marnie be at this performance to begin with? The show is beginning to take on a Real Housewives dynamic, where the action exclusively generated by people who probably shouldn’t be occupying the same space finding themselves in the same spaces over and over again. I loved the scene between the feuding sisters, which builds up to the most aggressive shimmying I’ve ever seen. Hannah decides she’s a really good dancer.